Attend the MRFM most Saturdays all year round. Being a family owned and run business, we are open 7 days a week at our tasting room in Margaret River. We also attend the Margaret River farmer’s Market all year round providing samples of our extensive range of nougat products. Our nougat is hand crafted in small batches using a secret family recipe. This French style nougat is a very moreish treat with a creamy, rich texture unlike any other. In 1988 we set up a vineyard and winery on their Margaret River property. After 18 years of making premium wines we decided there was another product we also had a passion for and this is where the nougat began. 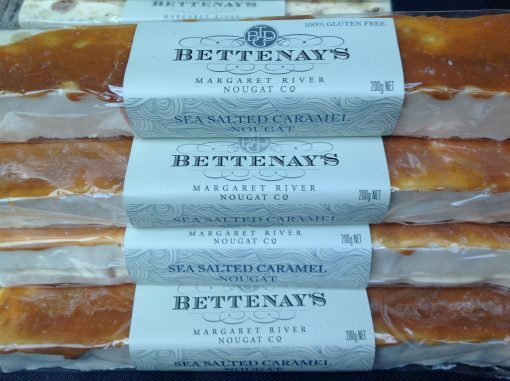 Sourcing the finest fruit and nuts as well as local honey, Bettenay’s Margaret River Nougat is the ultimate moreish treat. All our nougat is made in small batches and each bar is hand wrapped and crafted. Our bars contain all natural ingredients and have no added preservatives. Although based on a French style, our nougat is made using a secret family recipe and is a style of its own, a uniqueness unlike any other. Our current nougat range is continually being updated with new combinations. We have three nougat bases being traditional, white chocolate and milk chocolate. Fruit and nut combinations are added to the base nougat and we are always in search for the ‘perfect’ flavour combination. Many say that the Cranberry & Pistachio is the ultimate flavour. We could agree however there is no harm in continuing the search. You are more than welcome to join us in this venture. See website for complete tasting notes, alternatively come to the markets and taste for yourselves. In 1988 we searched the Margaret River region for an ideal property on which to grow grapes. Eric Bettenay, Greg’s father, had spent many years working for the CSIRO mapping the soils of Western Australia. With Greg’s academic background, an Honours Degree in Horticulture, it is not surprising we ended up with one of the best vineyard sites in the region. Last year alone, saw our new releases receiving a total of 37 medal including being a finalist in the Sheraton Awards for our Cabernet 2007. Our Chardonnay received a Gold at the Margaret River Wine Show. Here’s hoping for an equally successful 2011!!! The Lost Plot range started back in 2000, originally to market the infamous Chilli Rose. Soon after, the range increased, becoming well known around the area for the Lost Plot Dog. This range continues to be a big seller, bringing a fun, new age, new world approach to wine making. We look forward to welcoming you, to share in this treat of treats.